Earlier this year, a friend asked if I’d be interested in his 1980s Dungeons & Dragons stuff. He’d played a lot back when we were kids – I wish I’d known that at the time – but hadn’t touched the game in years, and thought I’d enjoy having the classic material on hand, since I now play regularly. Inside the Basic Set was a sandwich bag containing seven dice. The brown 10- 12- and 20-siders look like they came from the same original set. 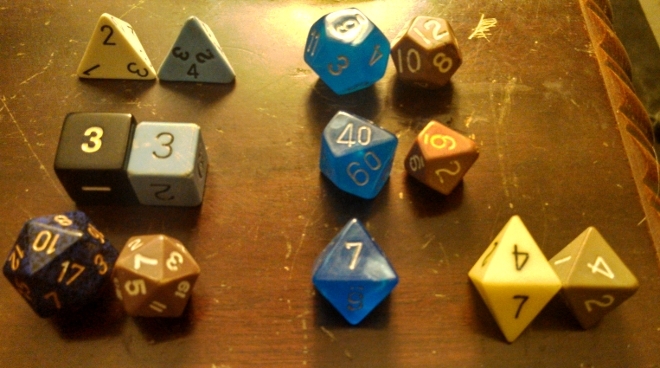 The light blue d4 and d6 are identical to the ones I got in my own red box Basic Set. The two d8s are each a little different. – but they felt familiar between my fingertips. And the d4 is numbered the way I remember from middle school, with the digits on the edges rather than the corners. Thing is, it was only last weekend that I had the realization that These Dice Should Be Rolling! 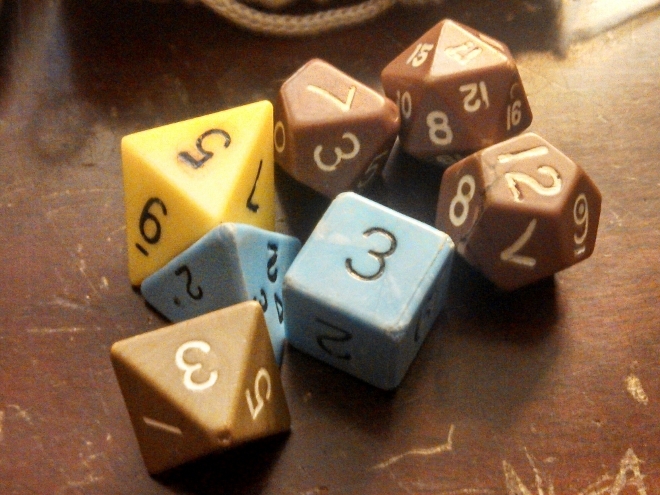 I retrieved them from the Basic box and tumbled them into my dice bag. 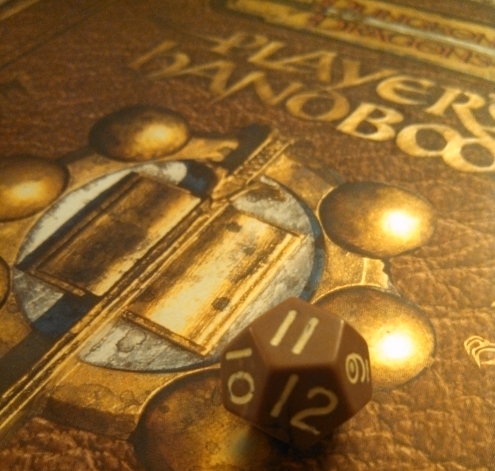 Tuesday night’s D&D session was entirely role-playing, but toward the end of the night, we rolled for a bit o’ treasure. You should start rolling the Old Bones all the time!!! I would roll my “originals” but I’m old and can’t see the numbers. The crayon is completely desiccated and nearly fossilized. You’ll definitely see them again!